Forcible administration of Castor oil as a laxative to infants and children is a tradition in South India. Accidental inhalation may result in a resistant form of exogenous lipoid pneumonia. In a series of 25 cases of lipoid pneumonia, 22 cases which were diagnosed by FNAC are reported. The technique is described and results analysed. The cytological features and diagnosis of262 thyroid lesions subjected to fine needle aspiration biopsy (FNAB) are presented and correlated with histopathology. The findings reconfirmed the overall utility of FNAB in the differentiation of non-neoplastic from neoplastic lesions. The difficulty in the diagnosis of follicular neoplasms and its differentiation from adenomatous goiters is highlighted. We review the circumstances in which false positives and false negatives may occur. The aim of the study was to review the cytodiagnosis of salivary gland lesions. From January 1990 to December 1996 among 150 patients with salivary gland enlargement referred for FNAC 106 aspirates were from the parotid gland (70.7%), 41 from submandibular gland (27.3%) and 3 (2%) from minor salivary glands of the palate. Fortysix (30.6%) aspirates were diagnosed as non-neoplastic lesions and 64 (42.7%) as benign neoplasms. Among the 40 malignant tumours 32 (21.3%) were primary, 4 (2.7%) were metastatic carcinoma, one was Hodgkin's disease (0.7%) and in 3 cases (2%) differential diagnoses were considered. Based on histologic correlation in only 53 cases (48.2%) the sensitivity of the test for malignancy was 79.4% (false negative rate 20.8%) and specificity 100%. Misinterpretation of the background stroma was responsible for low sensitivity in this study. The cytopathologist should be acquainted with the variety of background stromal material seen in different salivary gland lesions and correlate it with subtle cytomorphologic features to avoid major diagnostic errors. Cytologic examination of the sediment of voided urine is a good non-invasive method for detection, diagnosis and follow-up of bladder tumours. Fifty patients with complaints of haematuria were included in the study, cystoscopy, urine examination and biopsy was done in all the cases. Forty cases showed positivity for malignant cells in the urine sediment. Nine cases were reported negative for malignant cells and one case was suspicious for malignancy. Of the malignant lesions, 37 cases were diagnosed as transitional cell carcinomas and the remaining 3 were squamous cell carcinomas. 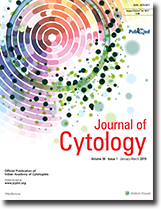 Histologic findings were correlated with the cytologic findings. The overall sensitivity was 80% and specificity was 100%. Quality assurance in the form of evaluating rates of correct diagnosis and errors is essential for any cytology laboratory rendering define cytological diagnosis. This audit was performed to assess the accuracy of aspiration cytology for preoperative diagnosis of cancer of the breast and detect the reasons for histology/cytology discrepancies. FNAC was performed on 705 patients presenting with palpable breast lumps. Tissue for correlation was available for 221 (31.34%) cases. These included 15 cases in whom cytologic material was insufficient for diagnosis. The final statistical analysis is based on 206 cases in whom cytologic diagnosis was given. 0f the 206 cases, 136 were benign and 70 were malignant on histology. The rate of false negative diagnosis was 4.28%, and false positive was 2.2%. No mastectomies were performed for benign disease. The sensitivity of the procedure was 95.71%, specificity and efficiency of the test was 87.08%. The positive and negative predictive values were 95.71% and97.79% respectively. The likehood ratios (LR) for a positive and negative test were43.39and0.044 respectively. Our results indicate that cytology can detect benign and malignant breast disease with high accuracy: The use of aspiration cytology to exclude malignancy is more difficult. Reasons for histology/cytology discrepancies are multifactorial. The test statistics described in this study could be used as guidelines and standards for judging whether a cytology department has gained sufficient competence and skill in diagnosing breast lesions by FNA. Cystic Hydatid Disease due to infection with the Echinococcus has a worldwide distribution. Immunodiagnosis, although sensitive and specific is not always reliable. The cytologic features in liver aspirate of a 54 year old male and in transrectal aspirate of a 43 year old male were the presence of scolices and characteristic refractile hooklets. Retractile laminated membrane was observed in the histology sample. Although aspiration of echinococcal cyst is usually discouraged due to possible anaphylactic reaction, the two cases presented here were aspirated because they were clinically thought to be of neoplastic origin. A Casoni's test in one case was negative for hydatidosis. A negative Casoni's test does not exclude the presence of disease. Three cases of papillary carcinoma of thyroid - tall cell variant (PTC-TCV) diagnosed by FNAC are reported. All three patients were females between 26 and 42 years of age. Two patients had nodules in the right lobe of thyroid and one in the left lobe. In addition to the usual cytologic features of papillary carcinoma, these cases exhibited features such as presence of tall cells lying singly or in the form of rows of three to five cells. The height of cells exceeded twice the width. Mitotic figures were not increased. Histopathologic correlation was available in the first case. Follow up data was not available in any of the three cases. A case of diffuse, large cell Non Hodgkin's Lymphoma (NHL), with primary intracranial presentation is reported. Both intraoperative squash smears and histology were suggestive of Hodgkins disease (HD) due to the presence of Reed-Sternberg (RS) like cells in a background of small lymphocytes and histiocytes. However positivity of the RS like cells for leucocyte common antigen (CD45) indicated a diagnosis of NHL. This highlights the importance ofimmuno histochemistry in cytological evaluation, diagnosis and appropriate subtyping of lymphoma, particularly when there is potential for total cure of these neoplasms with specific chemotherapy.